The 1963 edition of “The Periodic Chart of the Atoms” by NIST's Henry Hubbard and William Meggers. Note that it includes the neutron, not now considered to be an atom. f all the many useful and interesting periodic tables on the Internet—the periodic tables of the animals, vegetables, and minerals—and U.S. Presidents, Vienna® Chicago-style hot dog condiments, SQL server dynamic management objects, and paleo food—the original Periodic Table of the Elements remains my favorite. 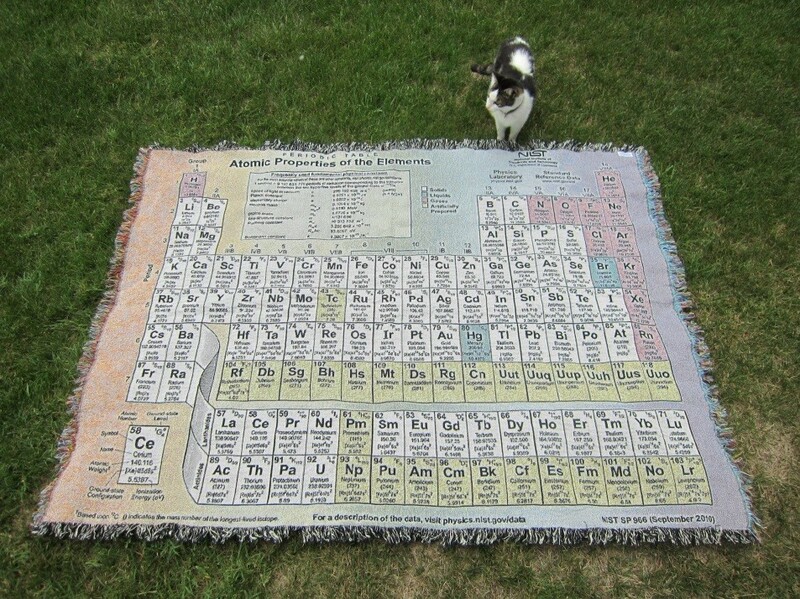 The TIFF encoding of NIST SP 966 can be readily converted into instructions for a Jacquard loom to produce a tapestry-woven cotton blanket, illustrated here with standard house cat for dimensional scale. There’s even a new Periodic Table Battleship game that has been designed to teach children the properties of the elements. You can download NIST Special Publication 966 to get the game boards for this. The NIST SP 966 code can also be sent directly to private-sector manufacturers to make a variety of useful things, such as the Periodic Blanket of the Elements. It’s not mine alone. While the multiplication table and tables of logarithms are pretty much forgotten, the meme of choice for purveyors of hot dog condiments or SQL-DMOs, is the Periodic Table of the Elements! NIST’s involvement with the Periodic Table began in the early days of the National Bureau of Standards (NBS), the name by which, aside from a brief period when we were just the Bureau of Standards, NIST was known as from 1901 to 1988. Nonetheless, the first secretary of NBS, Henry D. Hubbard, had a personal interest in the subject and devised a representation of “The Periodic Chart of the Atoms.” After being revised by pioneering NIST spectroscopist William Meggers, Hubbard’s table was later widely distributed by the Welch Scientific Company and can still be found in university lecture halls and laboratories around the world. 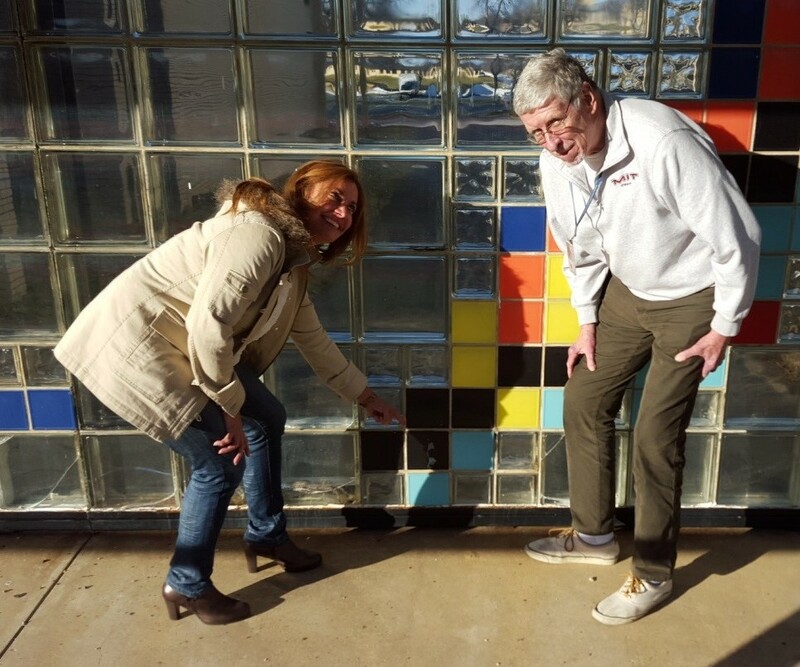 The neutron maintains its pole position on the Chart of the Radionuclides, seen here with Magdalena Navarro and Bill Gadzuk. The elements most recently named by the International Union of Pure and Applied Chemistry (IUPAC) are flerovium (114) and livermorium (116). The big winners overall seem to be the San Francisco Bay Area—berkelium, californium, lawrencium, seaborgium and livermorium—and Sweden—yttrium, nobelium and a whole bunch of the rare earths. Another tabular arrangement of the elements—the Chart of the Radionuclides—has its own impressive monument on the NIST Gaithersburg campus. Similar in shape to Long Island, the Chart has to be cut into three pieces to be conveniently displayed on even a large page (the photo just shows the Brooklyn end of it). Maybe that—or the fact that most of its entries are radioactive—is why it hasn’t yet captured the public imagination like the Periodic Table. And before I forget, happy (belated) National Periodic Table Day to all! Wouldn't it be nice if we had periodic tables of fundamental constants, of the relationships among units, of the relationships among the laws of physics. There does exist a model of the universe (the reflexive universe) conceived by helicopter inventor Arthur M Young which builds on the Periodic Table of the Elements form to include light, nucleons, atoms, molecules, and living creatures (plants, animals, humans). He has a similar format to Mr Aikman's that can be derived from his geometry of meaning.